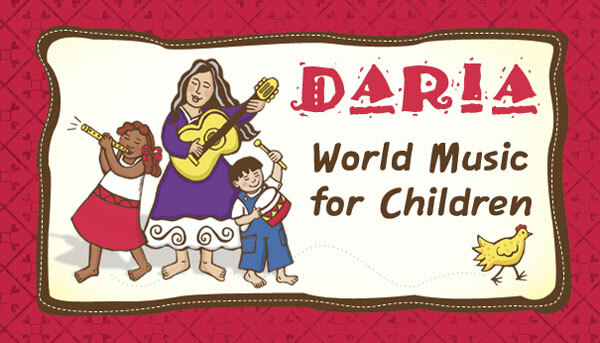 Daria Marmaluk-Hajioannou, simply known as DARIA, is dedicated to educating children about world music. As a world traveler and internationally known folksinger, DARIA draws from her experiences and delivers songs based on American and world folk music traditions. DARIA is passionate about in the power of creating and sharing music. To encourage this, she regularly features multi-cultural activities as a resource for parents, teachers, homeschoolers and kids of all abilities. Whether she is making crafts such as button castanets, transforming a cardboard box into a cajon (a drum shaped like a box), or mimicking the sounds of a washboard using manila file folders and a spoon, Daria encourages kids and parents to really experience music in a holistic way. We also enjoy DARIA’s monthly songs, which feature songs that are popular or represent celebrations in different countries around the world. This month, Daria posted lots of goodies for the upcoming holidays. In honor of Hanukkah, DARIA created two videos, the first of which is sung in English and Ladino (a mix of Spanish and Hebrew) for those that might be celebrating Hanukkah in Spain. If you are already a fan of Putumayo Kids, you will have no problem adding DARIA into your world music rotation. 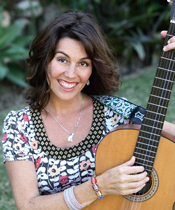 She is a talented musician with a beautiful voice that naturally captures the essence of a diverse range of cultures while also providing resources for kids to learn about world music in an experiential way. As Daria writes in her bio, “its all about empowering kids… letting them explore the world of music in a way that unlocks the amazing talent and inner beauty they naturally possess.” Definitely check her out! “Oh Dreydl” and “Ocho Candelikas – A Hannukah Song (Eight Little Candles)” are featured on Daria’s holiday album, Celebrate the Seasons: Multicultural Songs for the Holidays by DARIA, which can be purchased through iTunes and Amazon. And don’t miss Daria’s Dreidel Coloring Page and colorful instructions on How to Play the Dreidel Game. You can also enter to win a musical triangle and a set of finger cymbals here. Happy Thanksgivukkah! As Thanksgiving and Hanukkah converge this year, there are naturally some songs in honor of this rare occasion. Here are a few items to enjoy as you gather ’round with family. The term “Menurkey” may sound silly but the story behind its creation is awesome! 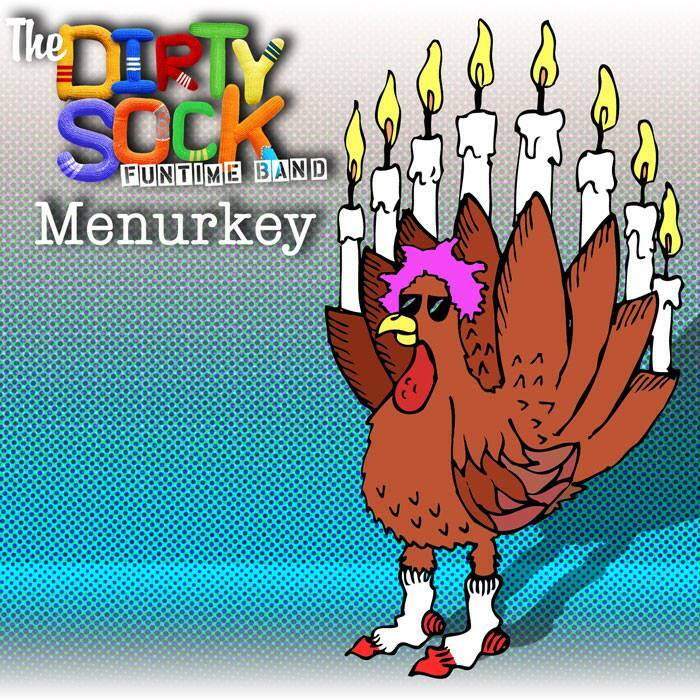 A Menurkey is a turkey shaped menorah that was created by Asher Weintraub, a 10-year-old boy from New York City. Asher initially thought of the idea based on the fact that the start of Hanukkah and Thanksgiving fall on the same day this year. And, thanks to a very successful Kickstarter campaign (820 backers), a limited flock of Menurkey’s will proudly shine this Thanksgivukkah and beyond. You can read more about how Asher created the Menurkey at the official Menurkey site. “Hannukah, O Hannukah (Introducing the Menurkey! )” is available for purchase on iTunes as is their recent release The Dirty socks COME CLEAN. 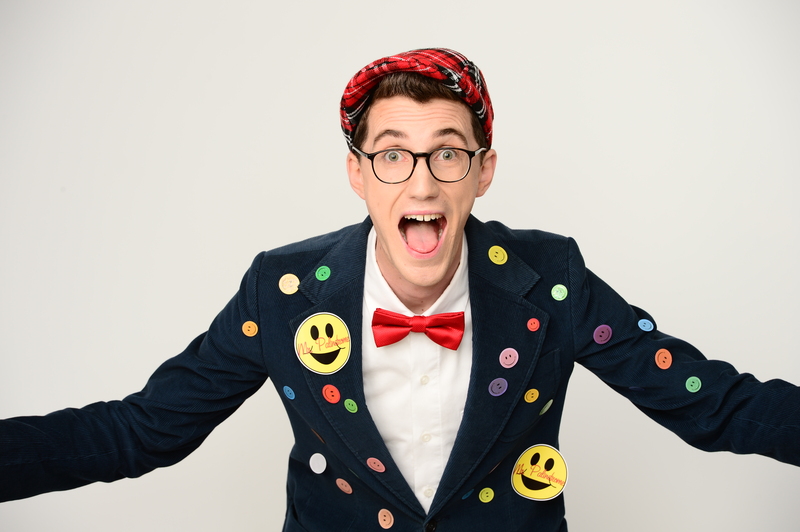 Mr. Palindrome, an Australia-based kindie artist who has recently picked up lots of great press for his album Smiley Face Sticker, delivers an entertaining adaptation of the original song written by John Rox (and made famous by 10-year-old Gayla Peevey) in 1953. The video is colorful and contains the fastest spelling of Hippopotamus I’ve ever seen or heard. After you are through unwrapping your gelt and spinning your dreidels, grab you kiddos and play along with this one! Mr. Palindrome’s Smiley Face Sticker can be heard and purchased through his Bandcamp page. Joanie Leeds talks turkey in her song “Tofurky,” a playful tune for those who prefer a vegetarian/vegan option for Thanksgiving. Leeds has a knack for producing quality videos and this one holds up in the same way. Cute video, great production value, catchy song. “Tofurky” can be downloaded for FREE via Joanie’s Bandcamp page which can be accessed through the Bandcamp widget below. “Tofurky” is available from iTunes. Also, be sure to check out Joanie’s video for “Family Tree,” which won her first prize in the Children’s Category of the USA Songwriting Contest. After reading a NYTimes article called “Holidays Holding Hands,” Deborah DidiPop Poppink wrote this song and had it up on YouTube in about 5 1/2 hours . The video contains tips about what to make for dinner and how the calendars collide on these two fun holidays – Hanukkah and Thanksgiving. 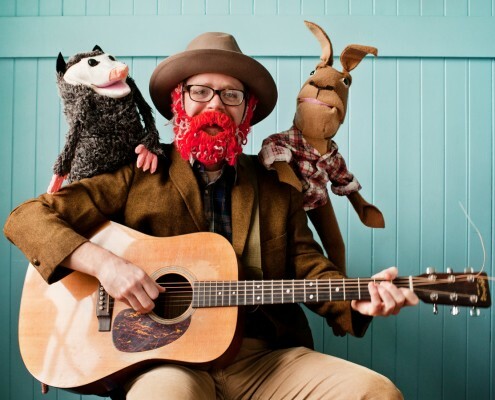 Andy Furgeson, aka Red Yarn, is a Portland-based musician, puppeteer and teaching artist who recently released his debut children’s album, The Deep Woods. The sound on the album is incredible, enhanced by a variety of instruments and a congregation of singers. For the production of the album, Furgeson hosted a community recording session with the help of 150 fans (as back-up singers). The result: a full-bodied folkfest filled with strings, horns, hand clapping and foot stomping. Leading up to the production of the album, Furgeson spent 5 years researching folklore within the confines of American folk music. Ultimately, he drew inspiration from the role animals played within these folksongs, resulting in The Deep Woods. Conceptually, the Deep Woods is a magical place where all the critters featured within the album’s 12 tracks can be found. Most of the songs, with the exception of the title track, are renditions of the originals from classic anthologies. While the songs sound upbeat, the lyrics are kept intact, illustrating the often dark interactions that take place between animals and humans. Because this is a children’s album, the many references to death and loss were surprising to me. I had a chance to interview Furgeson and upon reading his responses, my fascination with his work grew quite a bit. Read on for a more in-depth profile of Red Yarn and The Deep Woods. Kids Can Groove: Please start by introducing yourself since this is the first time you are appearing on Kids Can Groove. Some great things to include in the intro are how you got here and some of your musical influences. Andy Furgeson: Howdy! My name is Andy Furgeson and I perform for kids and families under the name Red Yarn. I collect American folksongs about animals and build puppets of the characters. My shows weave together music, puppetry and storytelling with the goal of bringing folklore to life for children. I grew up in Austin, Texas and have lived in Portland, Oregon for the last 8 years. Outside of the folk anthologies I dig through for material, I’m influenced by Bob Dylan, the Band, Pete Seeger, old Folkways records, and lots of modern indie, psych and folk-rock bands. I have a soft spot for Texas country and perfect pop songs. KCG: How did you find your way into children’s music? AF: When I moved to Portland after college in California, I was playing music for grown-ups and working with kids in an afterschool program. I wanted to combine these passions, so I began performing for families at a community center. My girlfriend, now wife Jessie and I started a kids’ band called Jelly Jar. We built a few puppets to enhance our shows and I got hooked on the energy of family audiences. 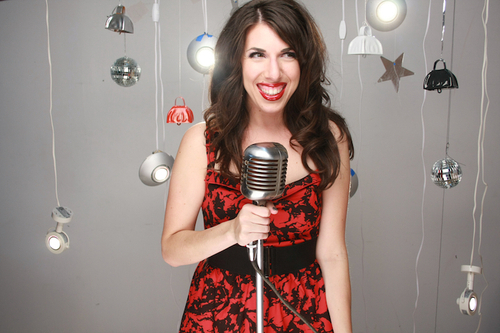 When Jessie went back to school to become a middle school teacher, I created my Red Yarn persona, began performing solo, formed a puppet band, and built my skills as a teaching artist. A year and a half ago, I left my afterschool job to make this my full-time career. It’s been growing steadily ever since. KCG: Where did the name Red Yarn evolve from? AF: I was looking for a simple but resonant moniker that kids could remember. While playing with anagrams of Andy and Andrew I found “red” and “yarn” right there in my name. Red like my beard, fire, lifeblood, the old country singer Red Foley, all that good stuff. Yarn like the puppet material or an old folk story. The name stuck and now more kids know me as Red Yarn than as Andy. I made a fake beard out of red yarn, which I sometimes wear on top of my real beard during my performances. Don’t ask me why—it only makes me sweat more! KCG: Your music is heavily rooted in traditional American folk music. Can you elaborate on your interest with this genre? Especially coming from a punk band in high school! AF: I’m fascinated by the idea of the U.S.A. and how music and art have played a role in shaping our national identity. American folk music is this vibrant document of the lives of real people throughout history. To understand our country, I think it’s essential for kids to learn about our musical heritage. Growing up in Austin, I heard a lot of folk, country, bluegrass and blues music as a kid. It was a central part of my musical upbringing. In high school, I went through a rockabilly phase, then got into punk rock with my band. I discovered Bob Dylan and bought an acoustic guitar, but kept the energy of punk and early rock’n’roll. Years later and I’m hollering and banging on my guitar just as loudly, only now for kids. KCG: You participated in the Lomax-A-Day and Song-A-Day projects. Can you talk about that a bit? It seemed to give you a deeper connection with folk music. AF: A friend turned me onto a group called the Artclash Collective who organizes the Fun-a-Day Project every January. They challenge folks to choose a project and complete a creative act each day of the month. In 2010, I participated with Lomax-a-Day, learning, adapting, recording and writing an analysis of a folksong-a-day from Alan Lomax’s book Folk Songs of North America. I’m not that great at reading music, so part of the fun was reinterpreting each song without referencing recorded versions. It gave me a real education on folk music and inspired my Deep Woods project. It was such an invigorating experience that I decided to do it again in 2013 with Carl Sandburg’s American Songbag. That project led right into recording my album and was just the creative jumpstart I needed. KCG: What is the Deep Woods and why is it magical? Do you feel that element plays an important part in engaging children? magical because it exists in our imaginations and memories, and because all the critters there walk and talk and sing and dance and feel feelings just like we do. All of my shows start with a magic spell to transform the venue into the Deep Woods. The spell sets the stage and encourages the audience to experience the show with wonder and belief. With young kids the line between fantasy and reality is blurred, so I like to play in the in-between. Puppets exist in that in-between. So do animal folksongs. So does performance itself. I approach performance as a magic act, with the ultimate goal of putting the crowd and myself in a joyful trance. When we awake from the spell, we’ve gone on a journey together that binds us as a community. KCG: Through your experience with folk music and its traditions, what drew you to exploring animals in folksongs and how do you feel they play a role? AF: I’m drawn to animal folksongs because they’re totally weird and dark, even though they’re assumed to be kid-friendly. When I dug into the old anthologies, looking for songs I could perform for kids, I was amazed by the strange narratives and depth of emotion I found in these little ditties about animals. These songs carry profound messages about life and death, love and loss and desire, all under the guise of animal characters. I got really excited when I discovered the overlap of characters from song to song, and from songs into folktales like the Br’er Rabbit cycle. That’s when I first imagined the Deep Woods as a single place to contain all these characters and tales. KCG: Through your research you have listened to a good number of songs from the past several centuries, can you discuss some of the songs you chose and why these songs resonated with you so strongly? AF: First I got really interested in rabbit songs. I was reading the old Br’er Rabbit tales, fascinated by the trickster archetype. I decided to create an updated trickster character: Bob Rabbit, Br’er’s grandson. He was the first elaborate puppet I built, and “John the Rabbit,” “Mr. Rabbit,” and “Buckeye Rabbit” were among the first songs I adapted. From there, I was drawn to songs that filled the Deep Woods with more colorful characters and life-and-death narratives. “The Fox,” “Froggie Went A-Courtin,” and “Who Killed Poor Robin” all have old English roots and seemed essential, even if they’ve been recorded thousands of times before. Some songs just floored me with their poetic lyrics and plaintive melodies–“Rattlesnake” is a great example. Some lent themselves perfectly to the community singing approach–“Old Blue” and “Turkey in the Straw” wouldn’t be half as good without that crowd of singers. There are many more animal folksongs that I considered including, but ultimately this seemed like the most cohesive collection. I might have to record a sequel album… we’ll see! KCG: The lyrics of the songs on The Deep Woods stay true to the originals which contains bits about death. While this is not completely atypical in children’s music, i.e. lullabies and nursery rhymes, it is more commonly left out. What was your thinking in preserving the balance between life and death throughout the album? AF: I’m really glad you asked this question. Death is absolutely a central theme in The Deep Woods, just like in the real woods, just like in real life. It’s a taboo subject in our culture but it’s one of the few things we all have in common. We’re often disconnected from aging and death. Many of our grandparents live in nursing homes or across the country. There are fewer and fewer community spaces where people of all generations come together. I certainly don’t want to upset anybody, especially not kids, but I think it’s important that we talk openly about the cycles of life, including death. In the old folksongs I sing, death is front and center. These songs have agrarian roots and were sung in settings where kids saw animals die every day. A song like “The Fox” helps a child understand why an animal would kill and eat another animal. “Mr. Rabbit” tells us that “every little soul is gonna shine,” but by the last verse the rabbit is “almost dead.” In “Froggie Went A-Courtin’,” the protagonist gets eaten at the end of a joyous celebration. “Who Killed Poor Robin?” is a straight-up funeral dirge, but it was one of the most popular nursery rhymes of all time. These songs deal with heavy stuff, but somehow the animal characters make it more digestible. Overlaid with simple narratives and human rituals, death is just another part of the story, the inevitable ending we all must reckon with. I hope this doesn’t sound totally morbid! I am a joyful person trying to live my life to the fullest and encourage others to do the same. But only when we face our fears, like the Booger Man in “Go to Sleepy,” do we remember to cherish every moment of this precious life. I hope that my recordings and shows can be a jumping-off point for parents to have important conversations with their kids. My wife and I are expecting our first child in February, and I know that being a parent might change my whole philosophy. But, as I bring a new life into the world and grapple with these scary questions, I’ve found great comfort in the straightforward approach of folklore. KCG: What led you to incorporate puppets into your music and performances? AF: At first I was just looking for another way to engage kids beyond music and storytelling. But then I realized how puppets could bring these animal folksongs to life. It’s one thing for a kid to hear an old folksong like “Mr. Rabbit.” It’s something more if she can interact with that rabbit, feed him a carrot, and laugh at his tricks in real time. When animated as puppets, these characters aren’t just dusty relics of American folklore. They’re your walking, talking buddies! As my puppetry has improved I’ve discovered what a powerful tool it can be. Puppets can bring kids out of their shells, teach crucial social-emotional lessons, and be much funnier than I can be alone. KCG: Do you create your own puppets? AF: I build the majority of my critter puppets but I’ve also had a lot of help along the way. Portland has a thriving puppetry community, with lots of independent puppeteers and bigger companies like Tears of Joy and Laika. I’m lucky to have talented artist friends who can build puppets on commission or help when I reach the limit of my abilities. At this point, I have a repertory cast of about 20 critters who appear in my shows. They travel around with me in a suitcase and cause mischief when I’m not looking. That reminds me, I’ve been so focused on performing, recording and releasing my album that I haven’t built a new puppet in a while. Time to get back to work! KCG: What can your audience expect from your live performances? AF: Audiences can expect a lively show with a lot of participation through singing, dancing, stomping, clapping and interacting with the critters. I try to pour my full energy into every performance, jumping around, singing at full voice, banging on my guitar, and running my puppets all around the room. I break guitar strings all the time. And I hold the dubious honor of being Portland’s sweatiest children’s performer. That said, I try to vary the dynamics to keep kids engaged. I mix in soft, sweet songs and bring the energy down when the critters come out. Kids help Shiloh Squirrel overcome his shyness by feeding him acorns, or give hugs to Sis Goose to cheer her up. The puppets help me show my own vulnerability and empower the kids to be helpers. When I’m lucky, I get to perform with my wife. When I’m really lucky, I perform with a full band and guest puppeteers. I’m hoping to take the show on the road this summer. I’ve done some mini-tours around Oregon, Texas, and on the east coast, but I’d love to venture further out and reach more families with these folksongs and animal characters. Holler if you know of a place for me to perform! 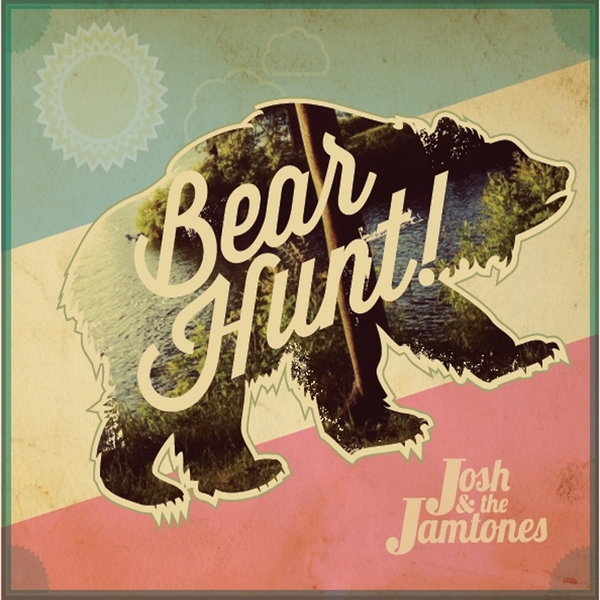 From their recent release, Bear Hunt, Josh & The Jamtones created a video for “Fill It Up,” The song has a nice swingin’ reggae rhythm indicative of the band’s sound. This is a great video for a Friday, especially after a long night of Halloween activities. Although the video is simple, it does a good job conveying the band’s sense of humor while sending positive vibes out to listeners. Poochamungas is a Chicago based kindie band that makes music echoing the likes of “The Boss” (Bruce Springsteen), John Cougar, Jerry Lee Lewis and even some Elvis. 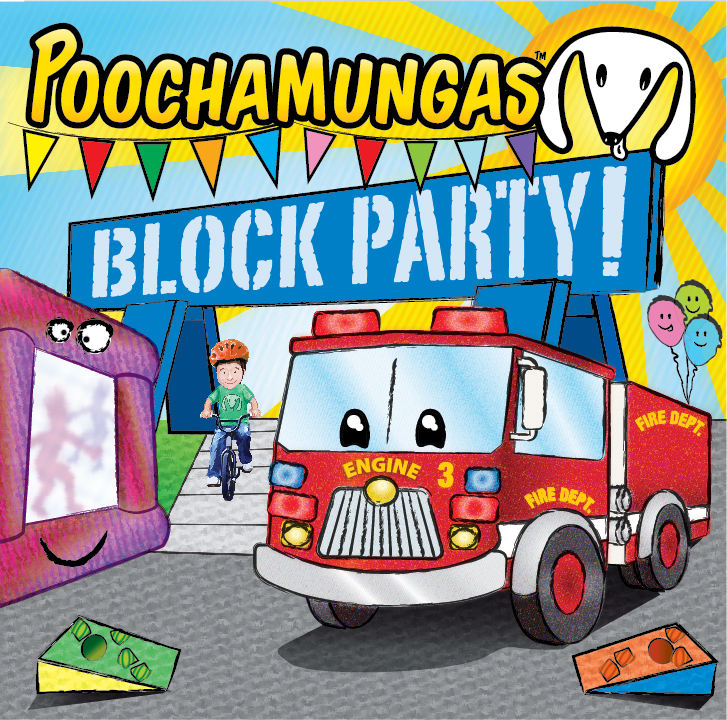 On their second kindie album, Block Party, Poochamungas channel their rock n’ roll sensibilities to create a collection of songs that are all about family, music and fun! “Little Ballerina” is a spoken word poem that captures the bittersweet feelings parents have of wanting to hold on to a beautiful moment with their children, while at the same time realizing how fast they grow up. It’s a sweet poem from a father to his daughter and one that I can completely relate to as my own daughter just started Kindergarten. Where does the time go?! We especially enjoyed “Refrigerator Box,” which captures the endless possibilities and wholesome fun to be had with a giant cardboard box and a little imagination. Lots of good ideas in this song! “Imagination Train,” is an awesome song with country and bluegrass influences. The lyrics will get you clapping and knee slapping as Anna Fermin‘s gorgeous voice emphatically calls listeners to “Take your ticket and get on board/ I’m the conductor, the engineer/ It’s the train in my imagination/ Destination anywhere.” The banjo and harmonica make excellent dancing partners in this song as well. Block Party is an album filled with heart. With their straightforward musical style, Poochamungas delivers a solid set of tunes armed with the conviction that music is meant to by shared by all members of a community. In other words, their motto that good music knows no age speaks volumes here. You can listen to digital samples, as well as purchase the album through CDBaby, iTunes and our affiliate Amazon.